Representatives of the RCLC were presented with a check Monday (Dec. 31), a day before the Blackhawks and Boston Bruins meet outdoors at Notre Dame Stadium. The donation will be used to increase access to youth hockey in South Bend in the RCLC’s new 13,800-square-foot building, scheduled to open in 2020. Currently, the center serves approximately 600 people each week. The new building will provide more activities to local residents, students and community members, including regular access to hockey clinics and programming. The Blackhawks, through their Get Out and Learn (G.O.A.L.) program, are providing the new center with hockey equipment, training programs and hockey clinics. Each year, the Blackhawks will offer updated training support for Robinson Community Learning Center staff and participants. To date, more than 300,000 students across 650 schools have participated in the Blackhawks’ G.O.A.L. program. The NHL’s donation will support a new computer lab that will include the Future Goals’ Hockey Scholar online program, which uses hockey to teach STEM (science, technology, education, math) concepts. The program is targeted to students in grades 4-7, leveraging hockey to teach critical STEM skills, develop scientific and critical thinking skills and introduce STEM-related hockey careers. 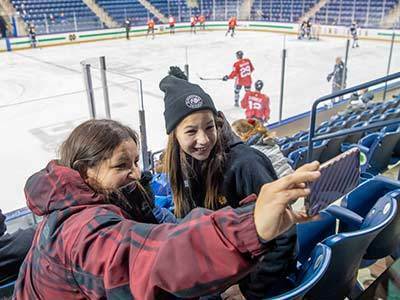 Additionally, the nearby Compton Family Ice Arena at Notre Dame will host its first-ever Little Blackhawks Learn to Play program this spring. The program will be open to children ages 5-9 who want to try hockey for the first time. Participants are provided with free head-to-toe equipment, instruction and certified coaching led by NHL alumni. Five participants will receive a “hockey scholarship” to the Learn to Play program, covering all fees. The Legacy initiative is an ongoing philanthropic endeavor in which the NHL and local clubs support community organizations in the host city of an NHL event. Since 2007, the league, its teams and partners have collectively donated more than $1.6 million to communities across North America. In the past decade, the Legacy Projects have aided thousands of hospital patients in recovery, helped at-risk youth and families gain better access to educational and vocational training, and provided greater access to people of all ages to learn and play hockey. NHL, the NHL Shield and the word mark NHL Winter Classic are registered trademarks and the NHL Winter Classic logo is a trademark of the National Hockey League. NHL and NHL team marks are the property of the NHL and its teams. NHL 2018. All Rights Reserved. Originally published by Dennis Brown at news.nd.edu on December 31, 2018.